The Nordic Noir catalogue is chock-full of novels that have everyone raving, so for once it is great to have a novel that divides opinion. This makes for a fuller debate and gets everyone’s critical faculties back into gear. Meet me in Malmö, the debut novel from Torquil MacLeod, falls into this category. I thoroughly enjoyed the novel but there were elements that jarred, both in a pleasing and a less positive way. The elephant standing next to me as I type this is the controversial ending. I tend to agree with those who found that it detracted from the experience of the book, though in my case it’s because I didn’t find it particularly convincing, rather than any sense of feeling cheated. That’s a shame because as a series opener, Meet me in Malmö makes a solid start. It’s interesting to have some main characters who are British, and to explore Anglo-Swedish relationships. It gives MacLeod, by trade a copywriter, the chance to flex his muscles. I haven’t seen the word ‘pong’ (as in ‘bad smell’) used since I stopped reading Whizzer and Chips, so it was delightful to remake its acquaintance. I wondered whether Anita Sundström would have used the British English idiom ‘field day’ but given that she had lived in Britain perhaps she would. MacLeod’s keenness to experiment with language is both intriguing and enjoyable. Outside the ending, the plot canters along with plenty of changes of pace. Herrings both red and pickled are distributed evenly. And in Anita Sundström, MacLeod has created a character who is down-to-earth, not wizened and cynical. She stands alongside other strong female characters in Nordic Noir. I felt from time to time as though she had been created with a TV adaptation in mind, so it felt like a vindication to find that the novel was originally a screenplay. It’s also fun to have in her colleague Westermark someone whom we can really despise. But I am not sure that the unsympathetic portrayal of the misogynist Westermark and the introduction of a potentially-great female lead make up for the lack of other decent female characters: I can’t be certain but I cannot recall a scene in which the dialogue would pass the Bechdel test. The problem, of course, is that we don’t know yet which issues MacLeod will develop in the rest of the series. By the time we get to the end of Sundström’s adventures, the above may seem a little harsh. Do I want to know how MacLeod develops as a writer and Sundström develops as a detective? Yes, and that’s all you can ask of a series opener. 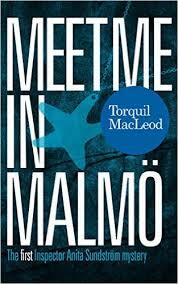 Meanwhile, as a stand-alone novel, the last page aside, Meet me in Malmö is a worthwhile read in its own right. At the time of writing this review, I hadn’t read Murder in Malmö, the second in the series. Read my review this coming Thursday as part of the Murder in Malmö blog tour. Thanks to McNidder and Grace for the review copy. This entry was posted on 17 August 2015 by Cafe thinking in Book reviews, Nordic Noir, Reviews, Writing and tagged Nordic Noir, Torquil MacLeod.